HD Vision Aviators sunglasses reduce glare and enhance colors and clarity, like no other glasses you have ever seen. Just imagine seeing every thing in high definition. 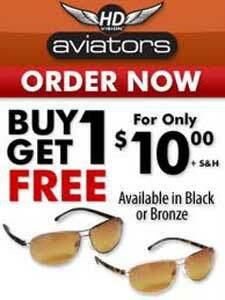 Other sunglasses just darken thing but HD Aviators enhance color, clarity, protect your eyes and feature great aviator styling. The last pair of sunglasses you’ll ever want. High definition optics at a price everyone can afford.